Swati Singh, wife of the expelled BJP minister Dayashankar Singh who was on the run for his comments against BSP chief Mayawati speaks aboutnever wanting to be a politician herself. 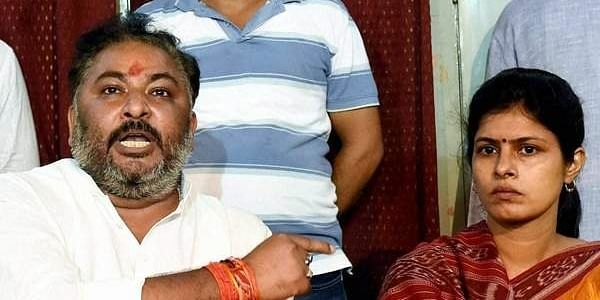 From a housewife, she became a politician overnight when her husband Dayashankar Singh was sacked from the BJP and was on the run due to his uncharitable comment against BSP chief Mayawati. Swati Singh is currently a BJP candidate from the biggest constituency—Sarojininagar—in Lucknow district, and is pitted against CM Akhilesh Yadav’s cousin. In a candid interview with NIE’s Namita Bajpai, she points out that despite never wanting to be a politician herself, she will never stop her daughter from following the path. What are the major issues you are facing? Women’s security is the biggest challenge. It is one of the gravest issues across the state and in Lucknow. My constituency is a blend of urban and rural electorate. Besides a fear-free society, people also expect basic amenities including better roads and better power supply. No development is possible without proper roads. Moreover, lack of schools is another issue here. In my constituency, a large number of management institutes have mushroomed in the recent past on expansive stretches of land but primary educational institutions are very few in number. It is high time that we bring some good schools in this area. How do you evaluate SP-Congress alliance in the state? People are fed up with the hooliganism and lawlessness which has been prevailing in the state for the last five years under the Akhilesh Yadav government. They want to get rid of this goondaraaj. Irrespective of any political alliance by the SP, people are going to reject it. However, their ally is a non-entity in the state. On the other hand, since Modiji enjoys a very positive impact on voters, it will help improve party’s prospects in the remaining phases. Has there been any impact of demonetisation in your constituency? I have got a mixed bag of voters who come from both rural and urban segments. Demonetisation has left a very positive after-effect here as the people, especially those coming from humble backgrounds, are happy that the rich and mighty are now at par with them after ‘notebandi’. In BJP, it is the right of our legislator party to choose its leader as the chief minister after being elected to power. In my party, anyone who is competent to serve the people in earnest is given a chance to head the government unlike the SP and the BSP which are family and personality centric outfits. While in SP, only a person belonging to the Yadav clan can qualify for the CM post, the thought of chief ministership starts from Mayawati and ends at her in BSP. Your entry into politics was more by compulsion. Did you ever have any political ambition? I am not new to politics. I was actively involved in student politics during my college days. However, I had been keeping a low profile after marriage as I was busy taking care of my two kids. After the controversy surrounding in which my husband was embroiled, my children and I were at the receiving end. Circumstances forced me to take the plunge as the party wanted me to step out and bring my side of the story to the fore. It was a lone battle which I fought then. But now I am fully confident and ready to take on rivals. seat on which CM Akhilesh Yadav has fielded his cousin Anurag Yadav who is playing all tricks to win the election. In view of the prevailing political scenario, will you ever want your daughter be a politician? Earlier, I never wanted her to be a politician but after having a first-hand experience of politics myself, I think if she will want to enter this field, I shall not stop her. How much help did you get from state government while facing BSP onslaught? Initially, the state government provided me security but withdrew it as I started appearing on electronic media with regard to the controversy. Though I approached them time and again to seek security for my kids, they evaded the issue for one reason or the other. Till date, no action has been taken against BSP leader Naseemuddin Siddiqui who not only was after my life but was not ready to spare my daughter. How do you see this metamorphosis from a house wife to an active politician? Active politics in this phase of my life is by compulsion. Initially, it was a bit difficult. However, I was never a novice to this domain. But knowing the nuances and actually being in the middle of them are two different things. When I was appointed the state chief of BJP women’s wing, I was apprehensive of the fact that I might be annoying many other aspirants who have served the party since long but have not got their aspirations fulfilled. So I tried to take everyone along on the assurance that they will never be denied their due in the organisation, especially in my wing.